I had so much fun making upcycled mittens from repurposed sweaters last winter that I just had to try some more. These would make great gifts. They’re easy and inexpensive to make. You can personalize them by choosing colors and pattern to match your “gift-ee’s” tastes. I went to the thrift store looking for a wool sweater to felt and repurpose and then make into upcycled mittens. I didn’t find a wool sweater that I liked. Bu-uuut…. I did find a gorgeous child’s sweater. Psst. 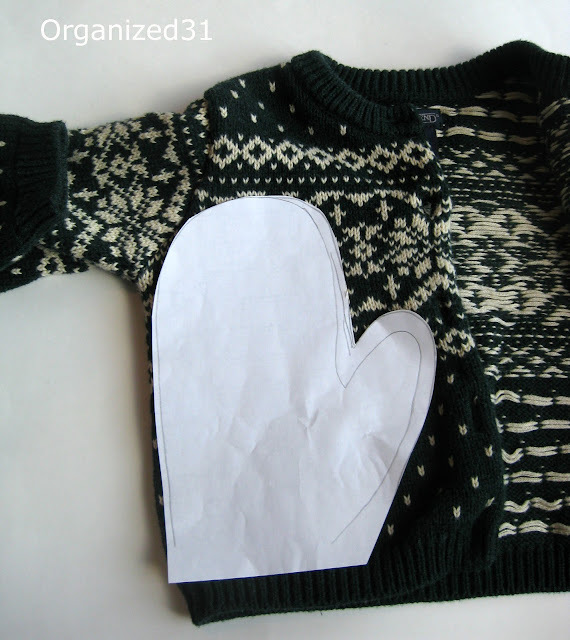 Look in the children’s clothing for sweaters to turn into mittens. 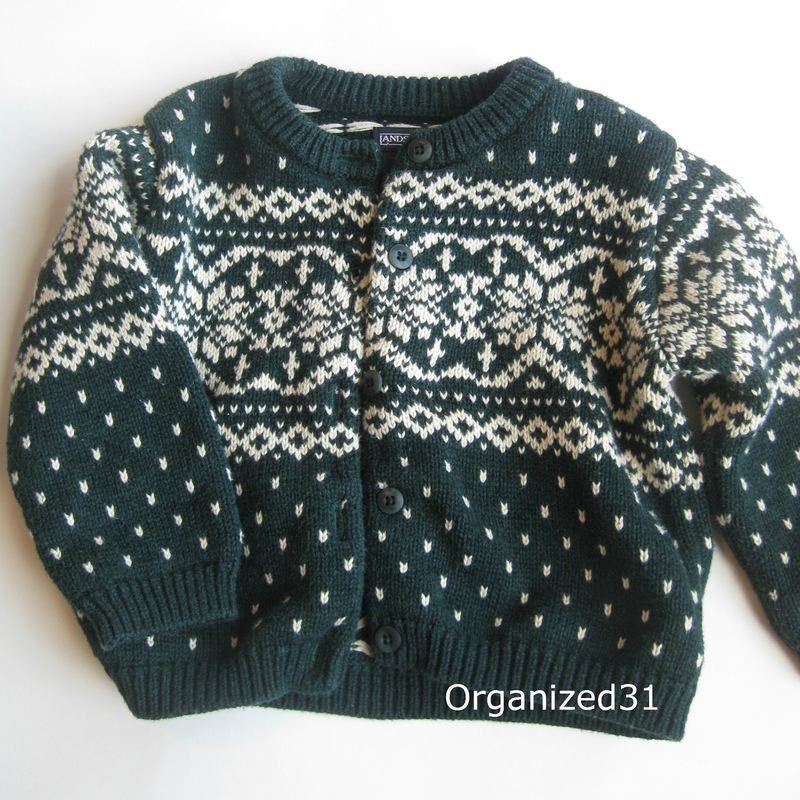 This was a size 18 months and plenty large enough to make into mittens. 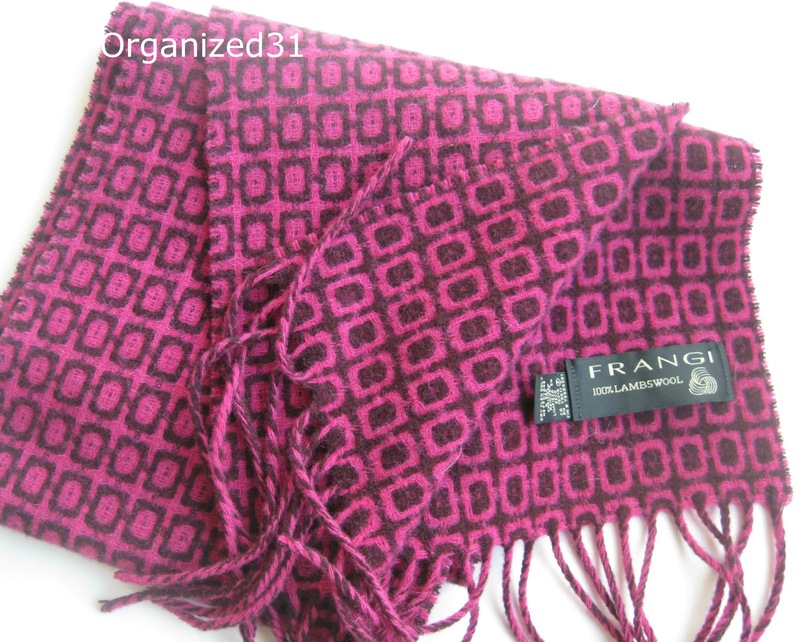 I did find a wool scarf that I liked. I wasn’t sure if it would shrink too much after the felting, but I decided to give it a try because I really liked the pattern and colors. I threw the scarf in the washer with a load of cleaning rags on hot. We use all natural cleaners so I didn’t have to worry about chemicals bleaching the scarf. I dried it on hot to continue the felting process. It didn’t’ shrink much. Whew. I used the mitten pattern I’d made earlier and laid it on the scarf. 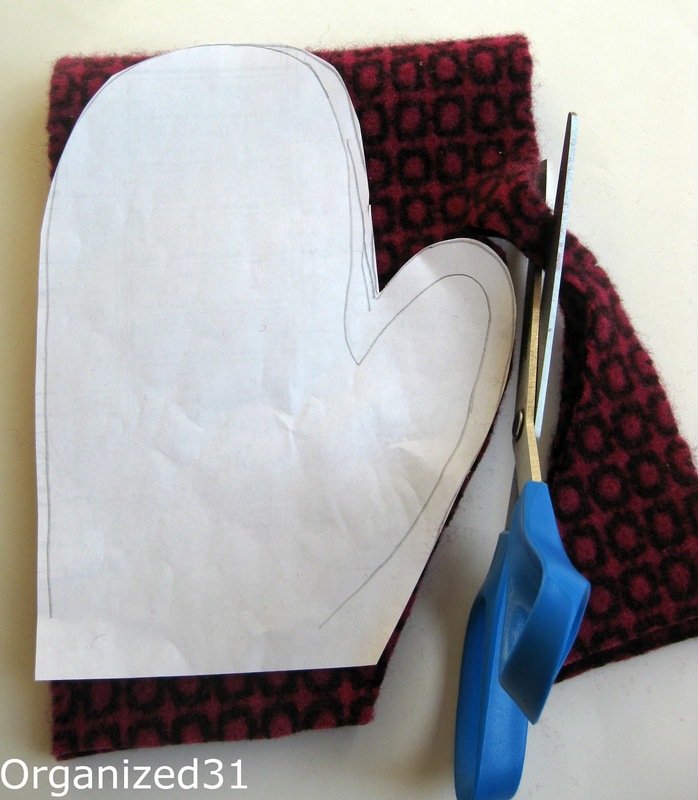 I cut out the 4 pieces for the mittens and sewed them up with just a simple strait stitch on the sewing machine. They turned out pretty cute. And they’ll definitely be warm. 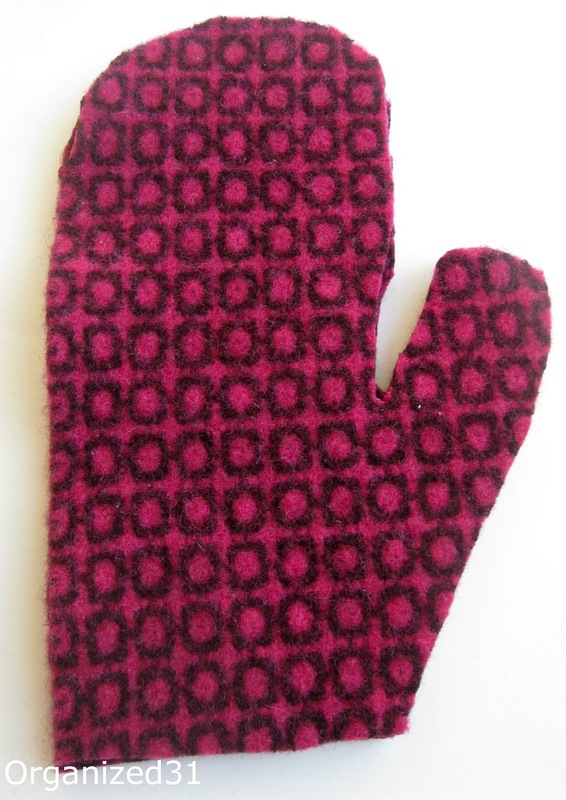 Because the fabric was felted, I just left the opening of the mitten as is. It won’t unravel and I didn’t want to make it too bulky by adding a hem there. Next, I moved on to the pretty green sweater. To minimize the amount of sewing on this more difficult (for me the non-seamstress sew-er) fabric, I laid the pattern so the outside edge is on the sweater seam. 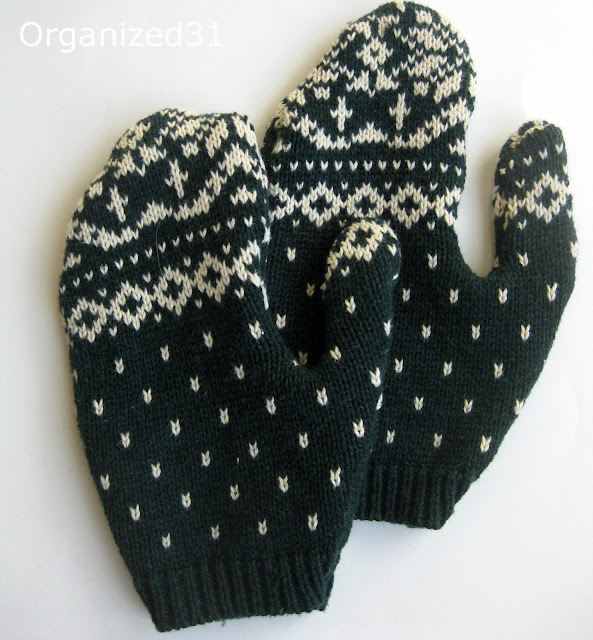 By using the sweater seam as the outside edge of the mitten, I don’t have to sew that area. The green mittens turned out even cuter. My oldest teen daughter snatched these up right away. I got the teen daughter vote of approval! I was just looking at a pile of sweaters in my closet that I’m quite sure I would never wear again and I’m not sure anyone else would either. This is a perfect solution! I just love these mittens! It has been so cold lately that I could use both pairs! I love felting things and repurposing them. I made a super warm lap quilt once by using old sweaters! Cynthia, I’d love to see that quilt. I’m still grinning because my daughter wore the mittens to school today. How about we find a sweater and make a pair of mittens just for you. You know I love these mittens. I want to drop by and thank you for linking this great post to the Living Big on Less Money link party! 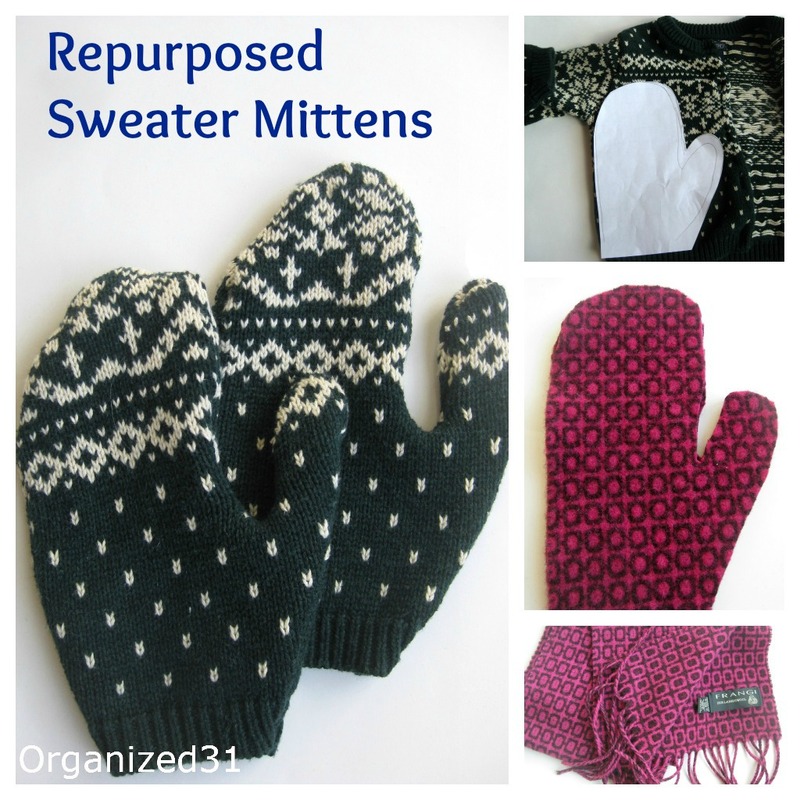 I do have some old sweaters, and I wish I had the courage to make these mittens out of them. I certainly could use them!! These are super cute, I love how they turned out! Pinning, and thanks for sharing at Creativity Unleashed! I love these! It’s a shame we’re are living in Australia for a few years……..
Susanne, you could always make them smaller as Christmas or winter decorations. Would love to know more about your upcycled sweater bins but the link doesn’t work and a seRch of your site doesn’t understand them. Can you help please! Love the mittens. Thanks for sharing. I’m glad you like the mittens, Gram. The upcycled sweater bins is still a favorite project of mine. The link works, it just has to be redirected because it was one of my original blog posts. 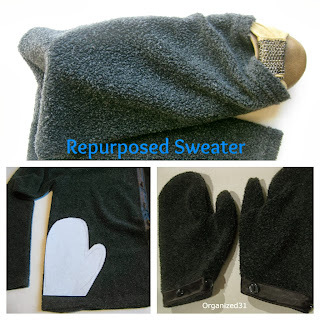 Here’s a direct link to save that redirect step – https://organized31.com/2013/05/upcycled-sweater-to-stylish-organizing.html .